Get the looks from your favorite Hollywood starlettes from The Golden Globes with products from Deborah Lippmann and Amika. Deborah Lippmann has been known to glam up some of the most high profile celebrities. It is no surprise that she polished one of the hottest stars of the season at this years’ Golden Globe Awards. Nominee Anne Hathaway looked absolutely stunning as she walked the red carpet in a pink Armani Prive gown, fully embellished with sequins and Swarovski crystals selected by celeb stylist Rachel Zoe. To complement the look, Deborah used a starry opalescent pink called I Dreamed You. Her nails were topped off with Rachel Zoe’s favorite top coat, Addicted To Speed. Glee star Heather Morris turned heads at the Golden Globes this year with a classic and elegant look and beautifully styled locks. Her stylist David wanted to create a super simple look that would allow the dress to really shine on its own. - Start with 2 - in -1 Volumizing Spray at the root to give extra lift. 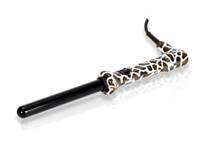 - To set the curls, start at the nape of the neck and wrap one inch sections of hair around the 19 mm clampless curler. - Brushed out the hair to form large waves. - Lightly pulled back the hair into a low pony tail with a clear elastic, leaving out the bangs and a small section near the front. - Twist the ponytail and pin into the base. - Finish the look with the Shine Spray for a gorgeous red carpet ready look.